been inspired to teach us the meaning of His revelation. Finally, today we inherit all this, and even the writings of holy men and women who help us understand, with greater clarity, the treasure of knowledge God has given us. Blessed John Henry Newman is such a man, and in his sermon, “The Law of the Spirit,” he explains the meaning of those words so familiar to our ears, but foreign to our comprehension: law, righteousness, and faith. Blessed Newman examines a verse tucked away in St. Paul’s Epistle to the Romans, “Christ is the end of the Law for righteousness to every one that believeth” (10:4). This epistle addresses both the Jews who rejected the Gospel, and the Gentile Christians who neglected what they received. At first, this verse seems straightforward and means Christians do not need to follow the Law because Christ has done away with it. But this common misreading Newman intends to correct. To do so, he breaks down the verse into the key words – Law, righteousness, and faith. 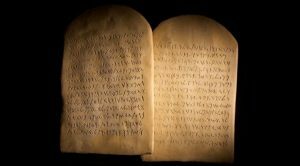 While the Law is reflected in the commandments given in Scripture, the Law has a broader definition. Blessed Newman explains, “By the Law is meant the eternal, unchangeable Law of God, which is the revelation of His will, the standard of perfection, and the mould and fashion to which all creatures must conform, as they would be happy.” The Law reflects God Himself, Who He is, What He is like. The Law given to the Israelites was a shade of this Eternal Law, “and though earthly and temporary, had at the same time a divine character,” much like Adam, as a man of dust but made in the image of God, had both a human and divine aspect to him. Righteousness is even more obscure to our ears and difficult to translate. “By ‘righteousness’ is meant conformity to the law,—that one state of soul which is pleasing to God. It is a relative word, having reference to a standard set up, and expressing the fulfilment of its requirements. To be righteous is to act up to the Law, whatever the Law be, and thereby to be acceptable to Him who gave it.” Again, Newman offers us the example of Adam before his fall; In Eden he was accounted righteous before God. When he fell, he lost his righteous standing before God, and his relationship with the Law changed. It no longer remained a light inside him; it became external to him, judging him and condemning him. For this we have to thank God, Newman says. Better that our consciences prick us, than that we are abandoned by the Law entirely. We must thank God for not leaving us in this state, but sending His Son to save us. In Christ, regenerated by the Holy Spirit, the Law enters into us once more, and righteousness with it. This is what St. Paul means when he says, “Christ is the end of the Law for righteousness.” In Christ we can stand righteousness before God; something we could never do when the Law remained external to us. Though this makes sense, it’s hard to believe. We know that in our natural state, we can never please God. We know it from Scripture and experience. We know, even after we give ourselves to Christ, we do not automatically conform to Law of God. Yet Scripture tells us we can stand before God as righteous, in Christ, and not in the disguise of righteousness, but in the reality of it. How can this be? Now understanding the meaning of this verse, we can understand how the Jews came to reject Christ and why the Apostle is so insistent on writing his epistle: “[The Jews] were in a path which never would lead to holiness and heaven. They were in a state which was destitute of grace and help. They were under the threatening and condemning Law.” Every effort they made would only lead them further from the right path. If they could only admit their mistake and turn around to start down the path of grace, they would find Him who is the Law. Yet this epistle was written for them and for us. For we too often miss the path. We tend to rely on ourselves, to settle comfortably and pridefully in the place where we are. Fr. Jacques Phillipe, in Time for God, says mental prayer is about allowing ourselves to be loved by God, which involves accepting our poverty before Him. Today, in mental prayer, we can thank God for loving us as we are, and ask Him to keep conforming us to the image of His beloved Son.